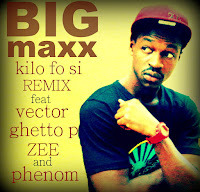 Bigmaxx signed to Capital Hill records records a remix to his hit single "Kilo Fo Si" that he released last year. He teamed up with Vector, Phenom and label mates Ghetto P and Zee on this one. Dope rap song this is and it was produced by on the rise producer "Daccoustic"